Would an Intervention Help My Addicted Loved One? Interventions are a popular theme in TV shows. The story is enticing—a young person or previously responsible parent goes astray and succumbs to the ravages of alcohol or drugs, is confronted by caring friends and family, and in just one episode, realizes the error of their ways and turns their life around, often through a miraculous yet accessible treatment program. But is the reality really as simple as reality TV would have us believe? Although shows featuring real-life interventions are helpful in giving hope to addicts and their families, and showing that change is possible, they don’t necessarily reflect an accurate view of reality, either for the individuals involved or how an intervention could turn out for those considering an intervention for someone they care about. 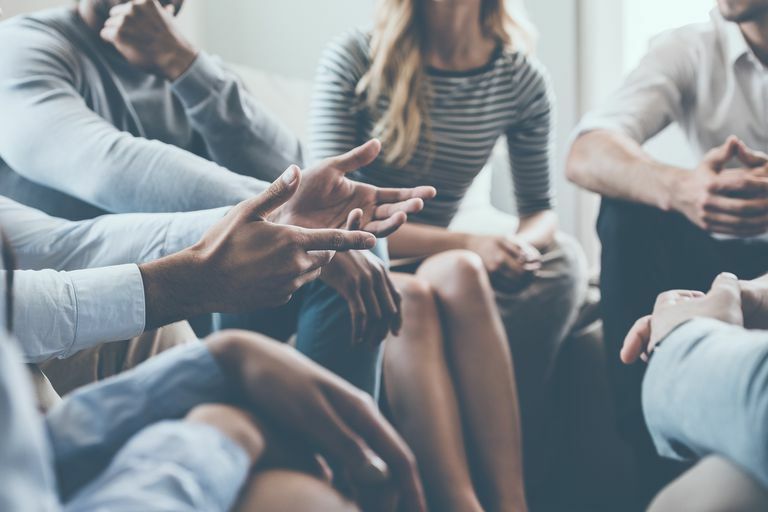 The term intervention can be confusing because it can be used to refer to the various therapeutic approaches used to treat addiction, many of which are evidence-based and effective. These include motivational interviewing, cognitive behavioral therapy, and couples therapy. These evidence-based treatments and several others, typically take time and commitment on the part of the addicted person but are generally helpful. What we are discussing in this article is not a treatment per se, but rather, a planned attempt by a group of people to persuade someone they are in a relationship with to either quit alcohol or drugs on their own or to seek treatment. This process may be led and guided by an interventionist who is hired by the family or group. An intervention may not be done in an aggressive way, although sometimes it is accompanied by expression of anger about past wrongdoings of the addicted person, and threats to discontinue or seriously limit the relationship, but it is always in some way confrontational—even if the confrontation is presented as an "invitation," which generally is not effective in overcoming addiction. From a professional standpoint, interventions cannot be recommended, simply because there is not enough research available to support their effectiveness. That doesn’t mean they can’t be effective; it just means that the studies we need in order to “prove” the effectiveness of interventions has not yet been carried out. While a few studies were conducted on the effectiveness of interventions in getting people into treatment during the late 20th century, they typically showed that family members chose not to follow through on confronting their family members. One study showed that when they did follow through, they were able to get their family member into treatment, but in the end, this was a very small number of people, and the outcome of therapy was not reported. Bear in mind that all therapies, no matter how effective, were at one time unproven, went through experimental stages and refinements, were funded for research, and finally, enough studies were conducted showing their effectiveness that they became accepted the practice. But just because they are accepted practice doesn’t mean they are guaranteed to work for everyone. From an anecdotal perspective, interventions have mixed reviews. Some clinicians have had the experience of working with people whose families have conducted interventions that have been helpful in persuading their loved one to get help. Others have had much more negative reviews, in which the intervention was poorly conducted or the addicted individual was not in a place to hear the feedback, and it caused an even greater problem for the addicted individual and an even greater rift in their family. So how do you know whether an intervention is going to help the person you care about? What seems to be the crucial factor is the experience and skill of the interventionist leading the intervention—perhaps this is why interventions appear so successful on TV shows with large budgets, the best-trained experts, and teams of professionals providing backup support to the individual and family. But in the real world, we have no current systems for evaluating the credentials of interventionists, nor for providing backup if needed, so there is very little information on which to base your decision. Why Would People Use Interventions If They Don't Work? Interventions for addiction are big business, especially in the United States, where they are often portrayed on TV. In desperation, families of people with addictions pour their life savings into interventions, hoping to save a loved one who seems to no longer see reason. Yet the basis of interventions is more about hype than about true recovery—reality TV is not in the healthcare business, it is in the entertainment business, and the drama of a carefully orchestrated and edited video story of confrontation and redemption is very appealing to the modern American audience. Part of why interventions are so appealing, and also, so unlikely to be effective, is that they offer the dream of a simple solution to an incredibly complex situation. We know from decades of research that people do not become addicted purely by nature or nurture, but a complex interplay between the two. Typically, someone with an addiction is struggling with underlying issues that they may not even be aware of, issues that an interventionist or well-meaning family member are even less likely to be aware of. Although a proportion of people are able to overcome severe addictions on their own, it takes great determination and access to alternative ways of coping to do this. For many others, overcoming addiction requires treatment, and it often takes many attempts to completely quit alcohol and drugs. Of course, this does not mean that people are never helped by an intervention. The process of becoming aware that your behavior is harming yourself, and those around you, is an important step towards recovery, and the first step through the stages of change from pre-contemplation to contemplation. However, confronting someone with an addiction is a very risky approach, and can just as easily backfire, making the addicted person feel attacked, alienated, and misunderstood instead of feeling supported. In these cases, an intervention can even worsen an addiction, causing the person to seek comfort in alcohol and drugs, and to seek out the company of those who "understand"—drinking and drugging buddies and drug dealers. Do you know anyone who was helped by the interventionist? If so, were their problems similar to those of the person you care about? Were their characteristics (such as age, culture, and how long they have had the addiction) similar? A personal recommendation from someone dealing with similar issues is often a way that people make decisions about therapists. Talk to the interventionist. Did you develop a good rapport? Do they seem to understand the problems you are describing? Do you get a good “gut feeling” from this person? What is the financial investment? How much do you stand to lose if it doesn’t work out? Could these funds be used on a different program that offers more credibility? Remember that although many people working in the addictions field know what they are doing and genuinely want to help their clients, there are others out there who just want your money, and will prey on the desperation felt by loved ones who are looking for a miracle cure. There are no miracle cures, and overcoming addiction is hard work, especially for the addicts themselves. The best approach to treating an addiction depends on a great many factors, including the substance being used, how severe the addiction is, the addicted person's attitude towards treatment and quitting or cutting down, and whether they have concurrent mental and/or physical health problems. A physician is often in the best position to discuss this with the person with the addiction, although many physicians do not have a great deal of training or expertise in addiction, and some are not comfortable working with people with addictions. The American Board of Addiction Medicine provides specialized training and certification for physicians, and so an ABAM certified physician is a great person to help people with an addiction find the right treatment, as well as provide a great deal of treatment themselves. Communication with your loved one is important in building and maintaining the trust that is required to support them in recovery. Often, trust in relationships can be badly damaged during an addiction, as the addicted person will often feel it necessary to keep their addictive behavior secret from their loved ones, often believing this is for their own good. Then, when the loved one discovers the addictive behavior or is faced with some of the negative consequences of the addiction, they typically feel betrayed and angry. You may not be able to persuade or bully your loved one into treatment, and in fact, trying to do so may actually make both their addiction and your relationship worse. On the other hand, honest and clear communication is typically very helpful. Setting boundaries around what kinds of behavior cross the line and are unacceptable, and making it clear that you have your own life and needs are extremely important in relationships with people who have addictions. This is often not easy, although knowing what not to say to someone with a drug addiction, and these tips on how to help an addicted friend or relative may be helpful. Liepman MR, Nirenberg TD, Begin AM "Evaluation of a program designed to help family and significant others to motivate resistant alcoholics into recovery." American Journal of Drug and Alcohol Abuse, 15:209-221. Miller W, Meyers R, Tonigan J. "Engaging the unmotivated in treatment for alcohol problems: A comparison of three strategies for intervention through family members." Journal of Consulting and Clinical Psychology [serial online], 67(5):688-697. 1999. Milller, WR & Rollnick, S. Motivational Interviewing: Helping People Change.Third Edition. New York: Guilford. 2012.